It is 1932, and you, Henry Annesly, have just shot your old colleague Crawford in his castle. Now his monstrous servants are enraged, and his resonance engine is splitting the very fabric of the universe, merging the castle with the alien worlds that coexist with the earth! Your only hope now is to shoot your way to the upper levels of the castle and shut down the machine before all existence is reduced to pandemonium! 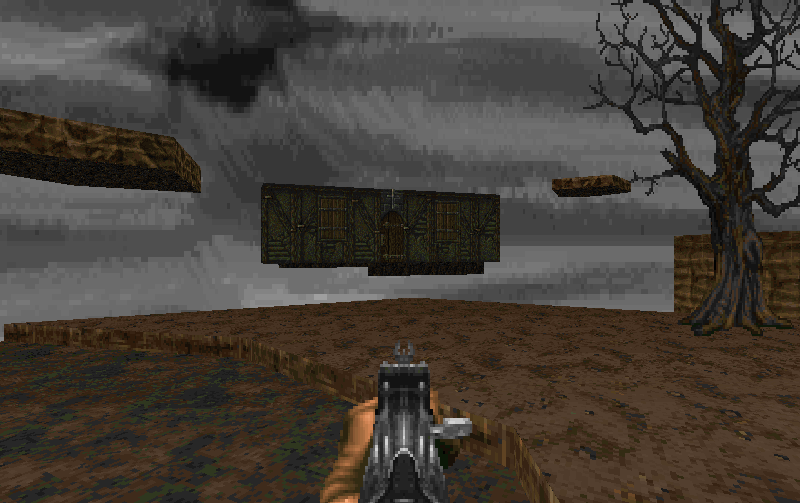 FEARS is a weapon/monster modification for The Ultimate Doom (NOT Doom 2), and a remake of the Amiga shooter of the same name. Use your flashlight to illuminate the ever-present darkness and blast beings from your worst nightmares. Play it with these Ultimate Doom wads! Got a Goodreads account? Enter this giveaway for a chance to win both Bishop & Holiday books, autographed by me! Interdimensional travel, red tape in the afterlife, mythical babes, three-headed dogs, alien spiders, and daemonic possession: all in a day’s work for the Bishop & Holiday Paranormal Agency. Read about the books here. He is one of the most influential horror authors of the 20th century, if not THE most. Pretty much every horror author cites him as a major inspiration. His writing style is very dense and archaic (gothic style), even for his time (prohibition and the great depression), so he’s not an easy read unless you have patience and diligence. Same goes for any gothic style fiction. He was a WASP and a keen racist who hated the idea of mixing races, and it shows in his works. However, that doesn’t make his writings irrelevant to the genre. Just adds an unfortunate sour edge to his bibliography, much of which can be reinterpreted thanks to postmodernism. There is no definitive guide to how to pronounce any of the names he invented. When people asked HP himself how to pronounce the names of his creatures, he gave a different answer every time – the idea was to give the impression of a long-forgotten culture, the names from which no one would know how to pronounce correctly. So if anyone tries to correct your pronunciation of Yog-Sothoth, Cthulhu, R’lyeh, or any of the others, they are a hipster and don’t know what they’re talking about. His entire bibliography is in the public domain, and available here. Lovecraft wrote a variety of macabre tales: from short traditional spooks to sprawling novels of poetic horror, and some are more effective than others. Here are what I find to be the best of his works: the scariest, most accessible, and least unwieldy for new readers. If you haven’t read Lovecraft before, these stories make for a good introduction, and may convince you to give his longer works a shot. THE LURKING FEAR. Something of a more traditional haunted house story, but with a cool new spin on the concept. The atmosphere is palpable in this one, and there are a number of climactic scares throughout, rather than a slow burn with no payoff til late into the story, like in The Shunned House (though it’s also a good read). The writing is as dense as you would expect from HP, but it’s worth it once he starts dropping the scares into your lap. Thinking of being in the protagonist’s shoes still gives me chills when I think of what he went through, and there are moments when the mere anticipation of a terrible event makes you squirm. A frightful delight. THE DUNWICH HORROR. Many of HP’s works involve a lot of buildup for very little payoff, but this one constantly raises the stakes and the weirdness, lacing it all with a thick atmosphere that really makes the degenerate backwater of Dunwich come alive. The reader gets a better sense of involvement than in Call of Cthulhu: both are great horror tales written in an investigative journalism style (forgiving the dense gothic prose HP loved so well), but whereas Cthulhu leaves the reader feeling far removed from the events described, Dunwich somehow manages to feel more like an event in progress, and feels more intense as a result. The actual horror doesn’t kick off until the second half, and manages to predict classic creature features involving giant monsters running amok in human civilization. Many of HP’s “big reveals” are telegraphed pages in advance like always, but the overall experience is a great one and leaves you with a broad collection of unsettling images and ideas. Great spooky fun, and definitely worth reading more than once. OUT OF THE AEONS. Essentially ghostwritten for Hazel Heald, this is a surprisingly effective tale of the mythos revolving around a strange mummy, an equally strange scroll, and one of the most frightening creatures in all of Yog-Sothothery. HP was fond of folk tales and mythology, and it really shows here: the story of the people of Mu is fascinating and feels like something out of a textbook, and the mystery of the mummy lends itself to a lot of spooky fun. It ends up feeling like the sort of yarn you’d read in a scary story anthology, albeit with a more archaic writing style. It’s underrated and highly recommended, despite the bogusness of the Mu culture irl, and a few questionable science fact elements. I also want to give a shout-out to Robert W Chambers, who inspired Lovecraft and wrote The King In Yellow, a great anthology and fascinating combination of proto cosmic horror and romanticism; and Robert Bloch, who contributed a lot of great stories to the mythos, collected in the anthology The Mysteries of the Worm. Note: Recommended resolution s 800×600 or better. Runner-up for the 13th Annual Cacowards! This is an atmospheric map set (45 levels) based on the works of H P Lovecraft, and inspired by a Doom clone I designed when I was a kid. Reunite with your dead son by traveling through your dreams and conquering four nightmarish realms: a shattered planet floating in aether, a dilapitated fortress of the future, the badlands of prehistoric earth, and the frozen Plateau of Leng. Now includes a fifth bonus episode, Out of the Aeons, set in the Underworld and the City of R’lyeh! A mod that allows you to use SA’s guns and monsters in other map sets. Combine Guns N’ Monsters with this music patch and the excellent Rylayeh wad. It now plays like an unofficial sixth episode!